Peter Andre at Thriller Live #4000. Images Betty Zapata. 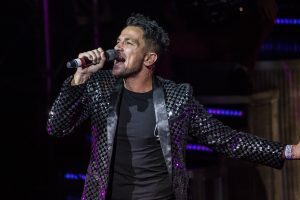 Thriller Live celebrated its 4,000 West End show last week at the Lyric Shaftesbury Avenue, with a special gala performance that featured a knockout guest appearance from Peter Andre. The audience may have been there to celebrate the life and work of Michael Jackson but, for one night only, their devotion briefly wavered towards another seasoned entertainer making his West End debut, giving him a well deserved standing ovation that disrupted the show mid-performance. Andre looked a little overwhelmed at the response. He had problems with his earpiece, and had to be gently nudged by one of the dancers into the right position. But after a few seconds he appeared right at home – particularly as his singing voice was so similar to the late MJ. He performed four songs – She’s Out Of My Life, Rock With You, I Just Cant Stop Loving You and Man In The Mirror – and the audience wanted more. Of course they did. They were on their feet and dancing and they didn’t want it to sit down (particularly three women in the front row, blocking everyone else’s view). Thriller Live is a hugely emotional show anyway so the adulation shown to Andre was the icing on the cake for this West End, and international, record breaking triumph. 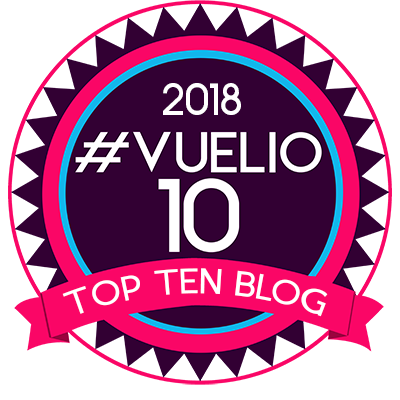 This particular show was not only celebrating a milestone but also raising funds for The Princes Trust – hence ambassadors impressionist Jon Culshaw and comic, Russell Kane, introducing the show and trying to squeeze cash out of theatre goers for a very worthy cause. Thriller Live is the culmination of one man’s dream, no, his obsession. Producer and creator, and long-time fan, Adrian Grant, ran the Michael Jackson Fan Club back in the 1980s and attracted the attention of the singer himself. Grant then started tribute gigs at the Hammersmith Palais, in 1991, and the germ of an idea for a celebratory show grew from there. In its earliest form the production began touring before it found a home in the West End and he must have known, right from the start, its potential. The show opened at the Lyric in January 2009, just five months before the star’s untimely death. It could have spelled disaster but, instead, it brought fans in from around the globe. Nine years later Thriller Live has played in 33 countries, more than four million people have bought tickets, it is the longest ever running show at the Lyric Theatre and the 15th longest running musical ever in the West End. It has also spawned its own “Thriller Live MJ Academy”, training up young boys, aged nine to 13, to appear in the next generation of shows. Whenever anyone asks me for a recommendation Thriller Live is my default answer. I’ve seen it numerous times and it is always fresh, electrifying and superbly produced. Director Gary Lloyd’s choreography is exhilarating, capturing all of MJ’s iconic moves. The large, ever changing, ensemble of singers and dancers, are some of the best on stage in London, and the entire production, with its innovative lighting, dazzling costumes, and terrific onstage band, is thrilling to watch. And Lloyd never lets the dust settle. The show is constantly evolving, with new arrangements and direction, to ensure it is still original and inventive. 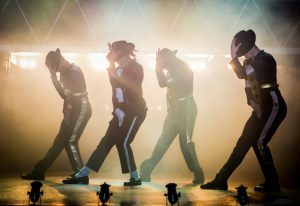 But at its heart are Michael Jackson’s blockbuster songs, ‘MJ’ himself moon-walking across the stage, and enough glitz and stardust to keep you mesmerised through a stupendous two-and-a-half hour show. Peter Andre was a delicious bonus to a very special night and, it seems, it has given him a desire to dip his toes into more musical theatre. It has been announced that he will be playing the Teen Angel cameo in a new UK tour of Grease. Not all venues but Andre will appear at certain performances in Leeds, Southend, Sunderland, Birmingham, Leicester, Dublin, Oxford and Bromley. In the meantime, Thriller Live continues – possibly indefinitely, although currently booking until April – at the Lyric. It’s one of the best value nights out in the West End. Electrifying, high octane entertainment at its best. Buy Thriller Live theatre tickets from one of our recommended theatre ticket websites. 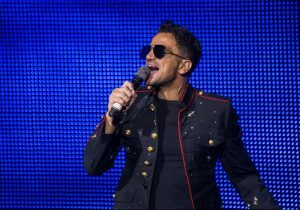 Peter Andre brings the theatre to its feet during a charity gala performance of Thriller Live celebrating its 4000th West End show at the Lyric. Dominic Dromgoole delivers justice and mercy in last season at The Globe.